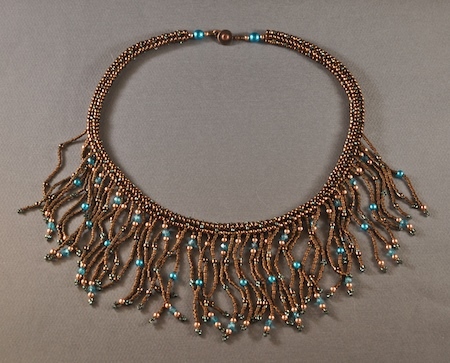 My copper peyote stitch necklace with the blue Czech glass dangles was selected as the Grand Prize Bronze Runner-Up in the Fire Mountain Gems and Beads 2011 Seed Bead, Glass or Acrylic Jewelry-Making Contest!! 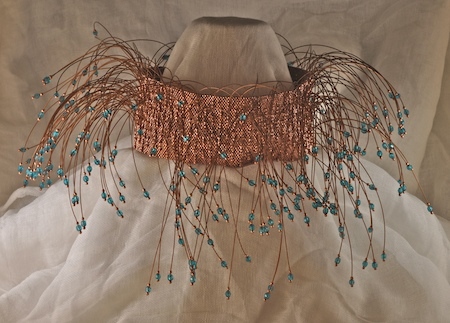 The inspiration for this necklace is a modern version of an Elizabethan ruff. 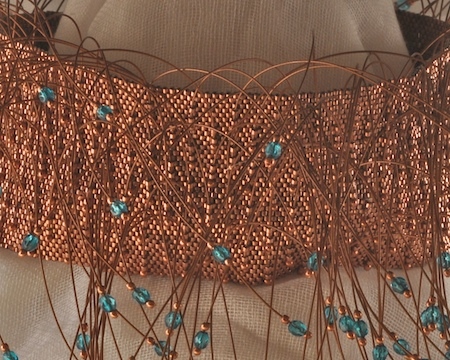 It is the next iteration in a series of experiments composed of variations on a peyote stitch chocker base supporting layers of ornamented wires. 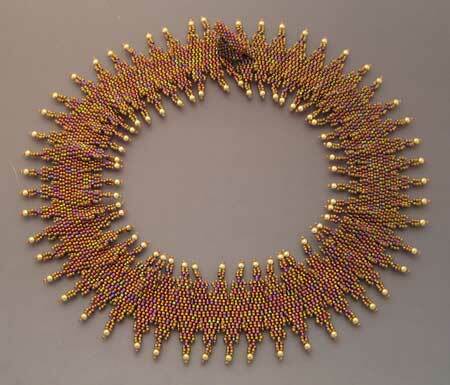 It is similar to the Grey Necklace, or the Bronze and Prickly Necklace. 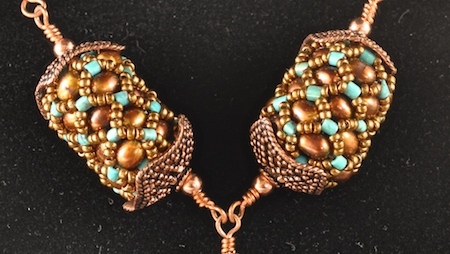 However, in this case I have used a wide flat band of peyote stitch rather than a tube and nine staggered rows of of blue czech bead dangles on copper colored wire. As with all projects, this necklace has been a series of missteps overcome. Initially I had thought to weave the dangles through the peyote base as I did with the tubular necklaces, but with the weave flat, the wires created too much distortion in the peyote base. So, it became necessary to stitch additional beads over the surface of the peyote stitch to carry the wires from which the blue dangles would hang. Then there was the issue of sizing the wires. If the wires were too thick, they wouldn’t drape properly, but if they were thin enough to drape nicely, they slid through the beads that supported them. It became necessary to stitch over the wires in their bead supports to hold them in place. The dangle necklaces are still a work in progress, however, I submitted this one to the Fire Mountain Beading Contest for seed beads. This piece was selected as a finalist and I am awaiting the result of the final judging. 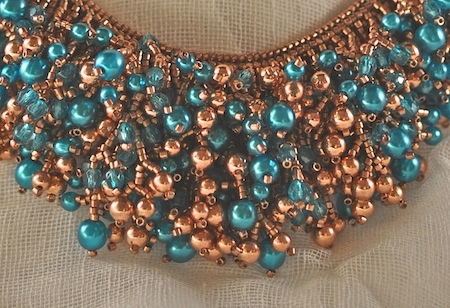 Copper herringbone necklace with blue and copper beaded fringe. Yet another necklace playing with the copper and blue color theme. It seems we have an ongoing experiment this year with copper and blue. Then again, theoretically it is the year for rose colored metal and having learned my lesson about running out of beads midway through a project, I decided to limit the colors I was using and instead acquired a relatively large stash of beads within a fairly simple palette. Thus, I am gradually working my way through the many and varied possibilities that might be rendered in copper and blue. The idea of restraining the palette came from looking at, and buying, kits from other designers. I noticed while looking at the available product from various designers that I would see the same, or similar color systems repeated. Limiting the designs in that fashion made sense. You would want to be able to save money by buying beads in bulk. So, kits would be more economical, and thus more profitable if you limited the palette. Getting back to this design, which, like the previous one uses a herringbone rope as a base. In this case, the elaborate fringe is heavy enough that it made sense to reinforce the beaded rope with wire, so there is a wire that runs through the center of the rope to carry the weight of the piece. As I think about it, I could have run a wire through each of the four columns created by the herringbone weave, which would have further reinforced the necklace. After making the herringbone base, I added multiple layers of beaded fringe. 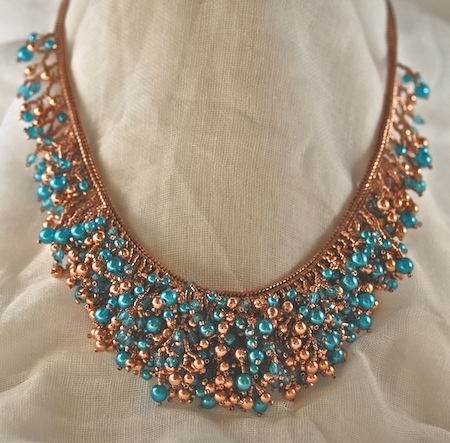 The fringe is fairly elaborate with large and small blue pearls, large and small copper balls, and blue bicones. There are four layers, with each layer being longest in the front and getting shorter as you work toward the sides. The fringes with the smaller beads and copper balls are branched to add density and variety, while the fringes with the larger copper balls and pearls are left unbranched. By working in layers, I was able to create a very dense look that was still controlled and weighted toward the front of the piece. 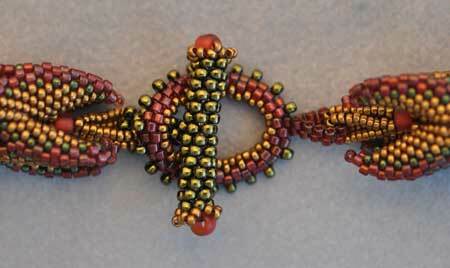 This was the first piece that I had made using metal plated beads. While I love the look of the metal, there are some problems in working with them. The metal plating is quite fragile and, at least in the case of the copper and silver platings, tarnishes quite easily. A large project can start to tarnish before you have finished it. Fire Mountain, the supplier for these particular beads, recommends spraying them with an artist’s fixative, but it isn’t clear when one should do this, or how. Spraying the beads before using them might mean they end up unevenly coated, so that spots on a particular bead might tarnish. Waiting until the work is complete and then spraying the finished piece means that parts of it may have tarnished already and you will have to figure out a way to very carefully polish the piece to restore the shine before spraying it with fixative. The whole issue is something of a conundrum. Which, as I mentioned I had bought in bulk, I will have to resolve at some point. I continue to search for a very gentle method of restoring the polish. This necklace came about while I was playing around with colors that might go with copper and blue. 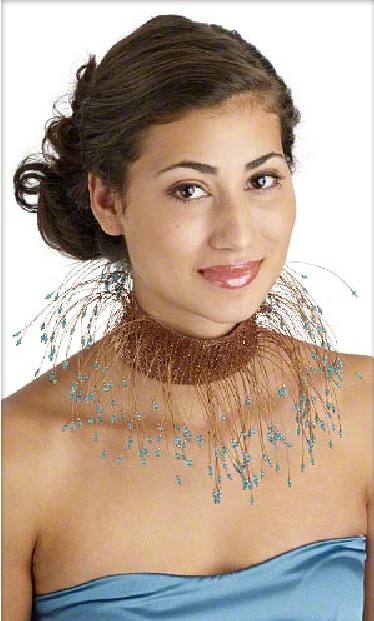 The supporting part of the necklace is done in herringbone stitch which also incorporates blue accent beads. The question with fringe and the accent beads is always one of how much is too much. So, the fringe is a series of variations and repeats. 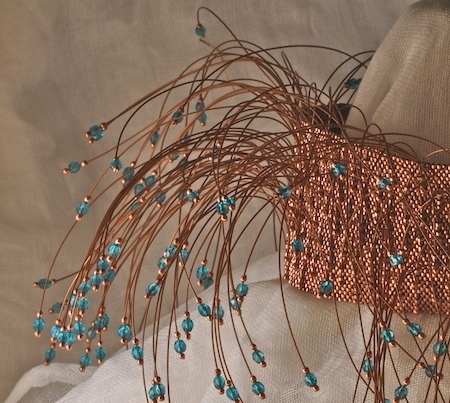 Detail of the beaded fringe. 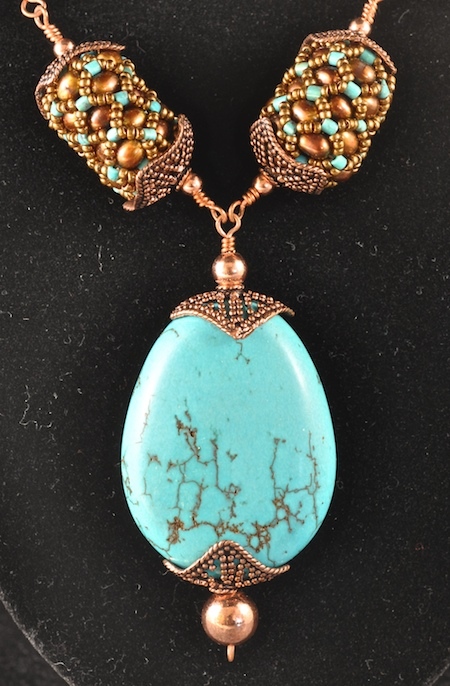 This necklace began as an effort to replace a netted rope necklace made with the same turquoise beads and bronze pearls that I had given to a friend. As is often the case, once you give something away, you decide that you passionately loved the piece, can’t bear to be parted from it, and must make it again. Of course, as it doesn’t do to repeat oneself. So, it must be an improved version of the earlier attempt. The version I had given as a gift was a netted rope similar to my earlier netted rope necklaces, the Rust and Silver Necklace, and the Blue and Gold Necklace. These necklaces use a fairly simple triple loop technique which yields a very nice, elegantly simple, flexible necklace. So, this necklace was to be a leap into the creative waters. I would utilize a five or six loop netting technique which would yield a much thicker, but consequently less flexible necklace. A bold statement, and why not! 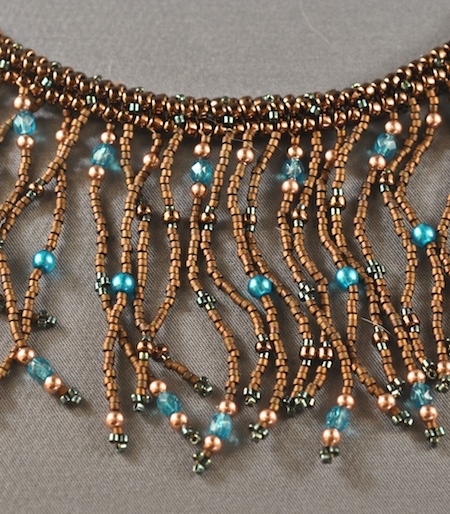 After spending most of a week beading away in a spurt of creative energy, I was fourteen inches into the eighteen inch strand, when I discovered I was running short of the little size 15 beads that serve as the connectors between the bronze pearls and the turquoise beads. A disaster!!! Anyone who has worked with color, beads, yarn fabric, tile, knows that the colorway is critical. Products bought at different times usually differ, just slightly, in color. If you have slightly different colors at the beginning of the project, you can blend the two and the minor variations will look like an intentional part of the design. However, if you run out of beads part way through a project and you need to change colorways, then it will look like precisely what it is, an error, a lack of planning. 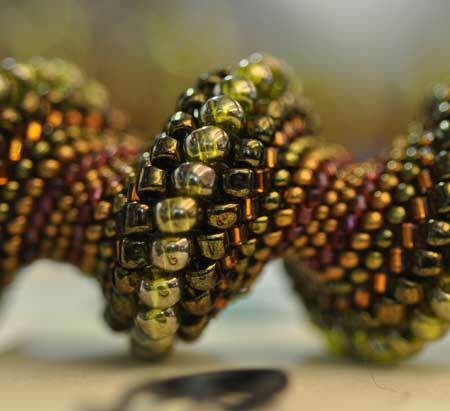 Or I coud make beaded beads. That was the answer. 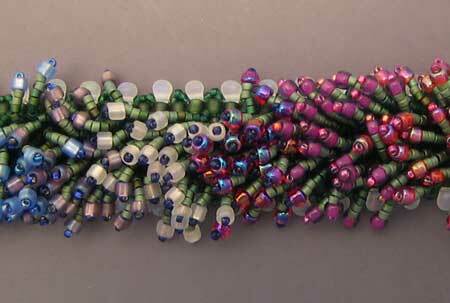 I very carefully snipped apart the netted rope every fourteen or so rows and finished each end to make beaded beads. Then I added copper bead caps and beads, and held the whole assembly together with copper wire wrapped loops. It is said that “necessity is the mother of invention” and in this instance it served me well. 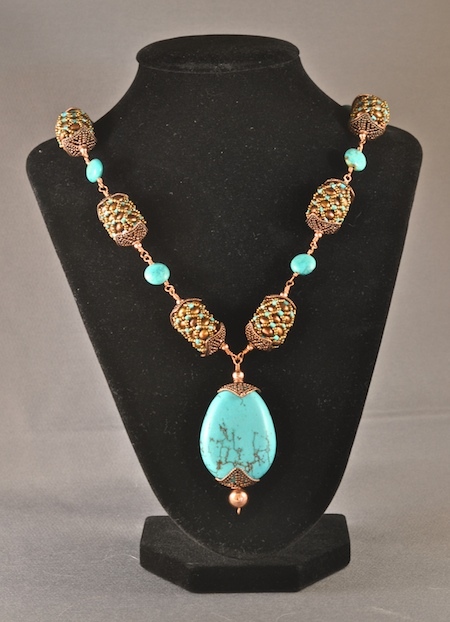 The beaded beads were a lovely way to experiment with the copper and turquoise colors that I had loved in an earlier necklace, but the end result was completely different from what I had done before. As a bonus, I was finally forced to learn wire wrapping, which I had been intending to investigate. 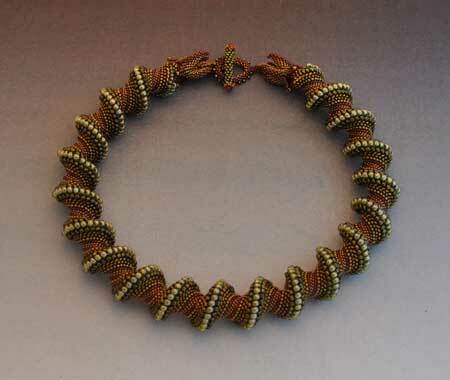 This necklace is a further exploration of the round peyote stitch spiral weave already shown in my Spiral Bracelet. In this necklace, I tapered the spiral to two ornamental “Dragon Claws” which create a transition from the spiral to the loop and toggle clasp. I learned the “Dragon Claws” from a kit by Laura McCabe, but I was not fond of the colors she selected and so I ventured off into exploring other forms of color combination. The shape Laura teaches is four sided and evolves from a combination of herringbone (Ndebele) stitch and peyote stitch. I have seen it done in a two sided version which yields a similar, but simpler shape. Making chain is meditative, well, at least I find that to be the case for me. 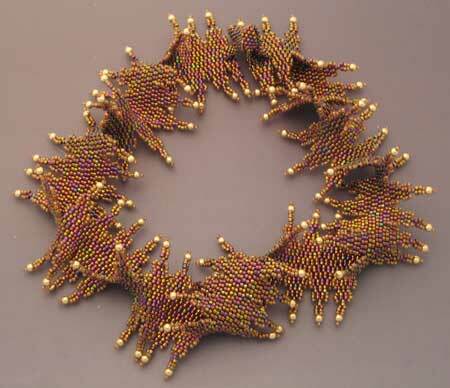 I first saw the simple version of this weave done as necklace by Christine Dhein who teaches at the Revere Academy in San Francisco. It has been about eight years since I learned to make this weave. I believe I bought some books and sorted it out on my own, but Christine does teach a class in how to make it and there are a vast number of variations. I have made a number of silver necklaces in Byzantine weave, including one for each of my nieces as a high school graduation gift. However, I had yet to make something for myself. I wanted something heavier, bolder with a more opulent look. I had considered doing something in gold for myself, but settled on sorting out how to do a triple variation of the standard byzantine weave. Which was just as well, because when I was half way through, my daughter decided that it would make a really nice bracelet. So, my necklace became two bracelets, one for my daughter and another for a very fine friend. The difference between the triple weave and the more simple standard weave is that if you view it from the end, in cross section, the standard weave looks like a square, more or less. The cross section of the triple weave will look like a triangle. I suspect this weave could also be done as a quadruple weave, but I have yet to try it. 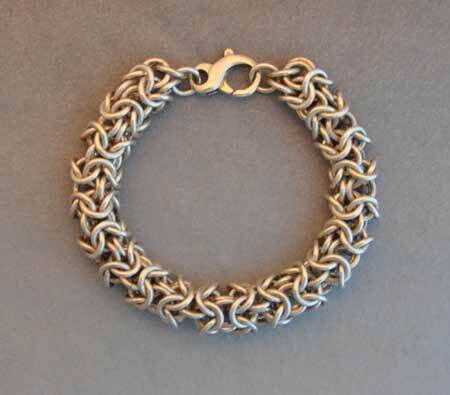 Triple byzantine weave in 16 gauge sterling silver, with 3/8″ inside diameter links. This bracelet is supposed to be reminiscent of the flowers in Monet’s gardens at Giverny and his paintings of them. The colors of the flowers blend from one bed to the next and are surrounded by a white picket fence of tear drop beads. 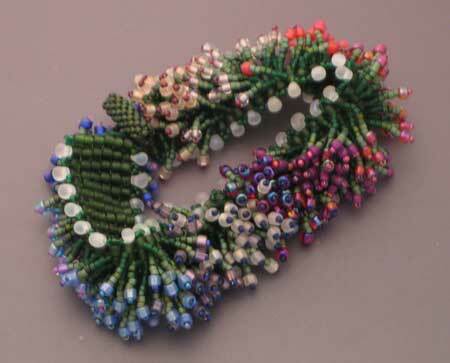 This is another bracelet that is fun to wear as the beaded flowers continually fall into new patterns as you move. This is another version of the Zig Zag necklace. I used the same basic pattern of 2 drop flat peyote with increases and decreases that I used in the first Zig Zag Necklace. However, I have played with the colors to emphasize the zig zag aspect, and this creates a much bolder graphic design. This is one of the first necklaces that I made. 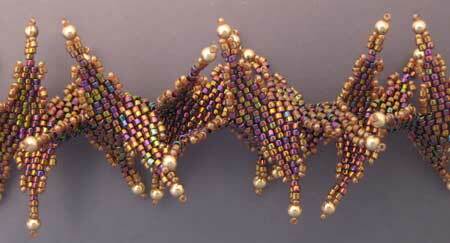 It is a pattern from “The Art & Elegance of Beadweaving” by Carol Wilcox Wells. This is a wonderful book . 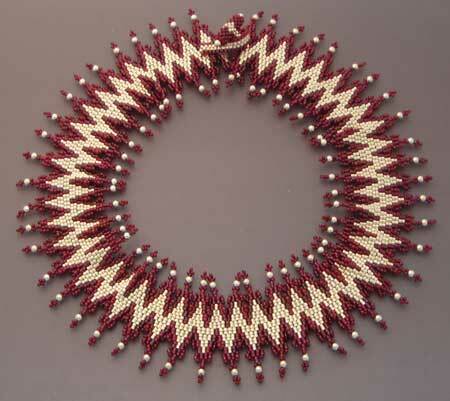 Using it I taught myself to do the flat peyote stitch that comprises this necklace. There are two rows through the center of the necklace that are continuous. The rest is composed of points made from increasing and decreasing as you work your way across the rows. The result is that the necklace flows beautifully around your neck and across your shoulders, conforming to your curves and hollows. It is very comfortable to wear. An unintended result, that I discovered as I played with the necklace and how to wear it, was that it can be twisted, loosely or tightly, for another more multi dimensional version. The twisted variation is shown below.